This session will cover the North Dakota requirements for home schooling. Theresa will provide instruction asnd give practical hints including suggestions for lesson planning and record keeping. This is the place to start if you are just beginning the home education journey or are just “checking it out. There are certain challenges that are common to most or all homeschool parents and their children, especially in the “early years” of home educating. And there are key considerations, pieces of philosophy, and practices that significantly enhance home educators’ success, attitudes, and joy. Dr. Ray will present to you some of the nuggets that he and his wife have gleaned from the home education of their eight children (now ages 30s to 19), and from years of research and learning from thousands of parents and families from around the world. No matter how picture perfect someone’s Facebook post appears, everyone has difficulties. These are part of your homeschool journey. It’s easy to let the issue of the day, or year, become such an emotional energy drain that we end up feeling deflated and defeated, unable to experience joy. God’s Word promises that if we will look at our unique trials through His eyes and allow Him access to our heart, mind and spirit, we will find that our problem is really God’s gateway to peace. How to start, where to find curriculum, when to school, and what a typical day looks like are some of the areas discussed. Get an understanding of Rule 12 and 13 and gain valuable information for your homeschool journey. This workshop is a MUST for new homeschoolers. This workshop will give you solid reasons for educating and training your children at home. You can teach your children positive socialization skills, train their character and develop an academic program to fit their needs. You’ll also learn about the homeschool law in Hawaii and gets some tips on how to get started. Want to give your preschooler and kindergartner an edge? Though it may seem counter-intuitive, having a playful relaxed, yet intentional attitude towards learning in the early years develops creativity, encourages curiosity, builds independence, expands attention span, enhances relationships, and has fun, too. And it is PROVEN to give them an academic edge! Join Heather as she share's the art of teaching young children through play. Question: What is the end goal of Christian home education? Answer: To love God more and serve more. Parents, your elementary-aged child needs an education in dreaming big. “But wait!” the parent says, “He can’t even complete his regular assignments!” Dreaming big can turn your ho-hum learner into an active one. We all need purpose behind even the simplest of tasks. We, as home educating families can get buried in a pile of book learning and forget what education is really for, to serve others. Please bring your wiggly child with you to this inspiring talk that just might change your city, state, country, or even the world. Disclaimer: There may be no stopping your child! If homeschooling up 'til now feels more like drudgery than delight, or if the thought of homeschooling makes your knees shake and your palms sweat, this is the workshop for you! Perhaps you've been hearing from “experts” that view homeschooling as just another form of education, like any other. Public schools think that way, but homeschooling is nothing like the school system. It's just the opposite. Learning at home is an adventure, a journey, a new lifestyle. Join veteran homeschool mom of seven (including one homeschool graduate!) Heidi St.John as she talks about the three things you’ve got to know as a new homeschooler that will set you on a track for success and enjoyment with your children. You’ve been blessed with this amazing bundle of energy. He has spent the first years of his life climbing anything vertical, “shooting” anything that moves, turning every serious moment into a wrestling match – and doing it all at top speed. And now you want to put a book in his lap and convince him that reading word lists and adding columns of numbers is fun??? Yeah, right. Homeschooling is the PERFECT learning environment for this child! Susan, a mother of nine children (including 7 wiggly boys) shares with you ideas on how to homeschool these distractible little bundles of energy (who’d rather be doing anything other than school)in such a way that you’ll be enjoying and utilizing their boundless energy instead of quenching their fire. And, of course, we’ll look at our own heart issues which are so quick to well up and spill out on those energetic little heads. This is a grace-filled workshop that will keep you laughing. 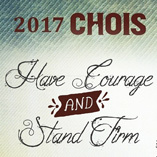 This contains all recordings from the 2017 CHOIS Convention. Sessions Included In This Set: 2017-0001Keynote - Be Strong and Courageous by: Mike Smith2017-0002Keynote - Priorities: Things I Wish I'd Done Differently by: Jessica Hulcy2017-0003Keynote - Bearing Witness by: Barry Peters2017-0004Keynote - Homeschooling: Why Stay the Course? by: Jessica Hulcy2017-1101Balancing Responsibilities for the Busy Homeschool Family by: Mike Smith2017-1102Jessica's Gems for Beginners by: Jessica Hulcy2017-1103Nurturing Brave Writers by: Julie Bogart2017-1104Identifying and Correcting Blocked Learning by: Pamela Gates2017-1105Parenting Heart to Heart by: Elizabeth Smith2017-1106Curriculum, Transcripts, Diplomas…oh my! by: Linda Patchin2017-1301The Power of Praise with our Children by: Mike Smith2017-1302Teaching the Child Rather than the Curriculum by: Jessica Hulcy2017-1303Partnership Writing: Becoming your Child's Effective Coach by: Julie Bogart2017-1304Teaching the Right Brain Child by: Pamela Gates2017-1305Getting them Ready to Learn and to Love it by: Elizabeth Smith2017-1306Battle for the Next Generation by: Mike Riddle2017-1401How do we Measure Success in Homeschooling? by: Mike Smith2017-1402Discovery Learning Fosters Critical Thinking by: Jessica Hulcy2017-1403Help for High School Writing by: Julie Bogart2017-1404Smart Kids who Hate to Write by: Pamela Gates2017-1405Preschool from the Ground Up by: Copper Webb2017-1406Educating for Success by: Mike Riddle2017-2101The Angry Child: What Ticks Johnny Off? by: Mike Smith2017-2103The Enchanted Education by: Julie Bogart2017-2104Training the Photographic Memory by: Pamela Gates2017-2105Balancing Home, Marriage, and Homeschooling by: Elizabeth Smith2017-2106When Bible History and World History Meet Face to Face by: Linda Hobar2017-2301What can Dads Do to Make Mom Successful in Homeschooling? by: Mike Smith2017-2302Teaching Everyone Together to Build Family and Stay Sane by: Jessica Hulcy2017-2303Creating a Language-Rich Lifestyle by: Julie Bogart2017-2304Dyslexia and other Reading Problems by: Pamela Gates2017-2305Teaching your Kids the Christian Worldview by: Jeralynne Bobinski2017-2306How One Person Can Make a Difference by: Elizabeth Smith2017-2401Homeschooling & Parental Rights: Freedom under Fire by: Mike Smith2017-2402Training the Will of a Child: How to Bend the Tree without Breaking the Branch by: Elizabeth Smith2017-2403Updating Charlotte Mason to the 21st Century by: Julie Bogart2017-2404The Biology of Behavior by: Pamela Gates2017-2405Mary and Martha Decide to Homeschool by: Linda Hobar2017-2406Your Job as a Support Group Leader by: Jessica Hulcy2017-T11Unleashing the Power of World History by: Linda Hobar2017-T12A Crash Course from Creation to Christ by: Linda Hobar2017-T13Conquering the Middle Ages by: Linda Hobar2017-T14Mastering the Renaissance and Reformation by: Linda Hobar2017-T15Modern History that Shook the World by: Linda Hobar2017-T21Four Things to Know About Dinosaurs by: Mike Riddle2017-T22Critical Thinking Skills by: Mike Riddle2017-T23The Bible and Time by: Mike Riddle2017-T24Two Power Questions by: Mike Riddle2017-T25Our history and our freedom by: Mike Riddle This set is subject to change without notice based on recording availability. Recordings that are lost due to technical difficulties or that are no longer available due to contractual agreements with the speakers, will not be included. No refund for missing sessions is guaranteed or implied. What inside tips would a teacher and a home schooling mom/teacher of 30+ years share with moms just beginning to home school? Come hear Jessica Hulcy share her wealth of practical advice and information in her hilarious Jessica-style on what she personally recommends young moms do and not do when they begin homeschooling. Be enlightened and encouraged and entertained…all at the same time! Our children come into this world with a will of their own, and the battle begins. Our task is to train them to follow Christ and develop into productive adults. If we use instruction and discipline correctly they will respond positively to our parenting. This session tells how to direct the will through consistent and loving training while nurturing a loving relationships between parent and child. From scheduling to home organization, this workshop gives parents the confidence that they can provide a rich early education for their little ones. Lesli provides an overview of what every child from 3-7 needs to cover over the course of one year, and how to fit it all in. Lesli provides solutions for the many challenges parents with young learners face, such as time management and schooling multiple ages at the same time. What are the legal responsibilities of Michigan home educators? Are there certain things home educators should or should not do? What are the two options under which families may choose to homeschool in our state? David will help you be informed, not intimidated, when it comes to answering questions, filling out forms, and dealing with school officials. For many men, homeschooling has been looked at largely as something their wife does. Shouldn it be that way? Many believe that if they pay the bills, that is really all that God expects of them. Biblically speaking, what is the proper role for men in the process of home education? In this world filled with technology and devices, intentional parenting is a MUST. Children get one shot at childhood and it is our job to make it count. In this presentation I will give you practical tips on how to engage and connect with your child. We will take a trip down memory lane that will make you laugh and possibly shed a few tears. Either way, you will be challenged and hopefully changed to take on parenting with a newfound passion. New clean copy uploaded July 7 - It’s such a temptation to stress over teaching predicate nominatives or the steps of division that we forget to delight in our children and make time to enjoy being with them. In this session, Marilyn shares how she has found this to actually be the key to instilling values that stick and building in them a heart for things of the Lord. Take the time to give your children the security of knowing they have your heart. In so doing you are making it easier for them to freely give their heart back to their Creator, and that is our mission. Catch a vision of how you can reach and hold the heart of your child and build fulfilling family relationships that will be passed on through generations. The teacher called him “addled.” His mother called him Tommy. The school couldn’t do anything with him. His mother made him a genius. What was the secret behind the success of Thomas Edison, America’s greatest inventor? His mother made learning fun. And you can do the same for your kids! Edifying and Terrifying--Our world is filled with words. Whether we are reading them, writing them, or instructing with them, they are our tools to build stories, create emotions, and make connections. Yet we need to be aware that words have the power to build or to destroy, especially when we speak them to our children, causing them to stumble or to soar! God has much to say about our words. They need to be crafted carefully and gently but firmly shared. This is how we can engage others and train up our children. Let’s contemplate not only the power of our words, but how we can boldly use them. Why should you homeschool? Using facts, research, evidence, and Scripture, Israel will address new and prospective homeschoolers about the benefits of teaching, training, and discipling your children at home. He’ll address subjects such as academics, socialization, character, relationships, and faith/values, arguing that homeschooling is the perfect means to achieving amazing ends in all those areas! This engaging presentation will be an overview of the many positive points of homeschooling. So, you’ve decided to homeschool your children. Now what? If you are at this jumping-in point and need direction navigating your homeschool journey, this workshop is for you! Homeschool mom-survivor since 2001, Linda Crosby is equipped to answer your questions: How do I teach several kids at different levels? Where do I find curriculum? What about report cards? Do I need an American flag in the kitchen? Do I need a teaching certificate? Can video games count as something? How much does this cost? Are pajamas a homeschool uniform? Where is the teacher’s lounge? Plus many, many more. Cassandra and Jennifer share encouragement and helpful tips on beginning your journey to homeschool your children. Come hear strategies to conquer common concerns like: curriculum choices, scheduling, home management, support, extracurricular activities, and rules & regulations. Get started preparing your new homeschool year. Paperwork quandaries?? Join Cassandra and Jennifer in a Q&A session addressing rules, regulations, and paperwork. What does it all look like and how do I comply with the NYS regulations? Join Cassandra and Jennifer along with a diverse panel of veteran homeschoolers as we do our best to answer your questions. Are you pulling your children out of public school? Do you have to juggle working in or out of the home as well? Are you a single mom? Are you considering a complete grade package for curriculum, on-line school, or a more eclectic approach? Take a peek at what learning looks like through the eyes of your preschooler with this hands-on workshop! Parents will be participating in various activities and discussing, as a group, the learning taking place. Where and how does one begin this journey called home education? Homeschooling doesn't have to be overwhelming or fearful. Come explore some simple tips to help you navigate the uncharted waters of the beginning years. You had a wonderful plan at the beginning of the school year for a well-rounded education, envisioning academic excellence and character development in your smiling, well-adjusted offspring. But then . . . life happened. How do you find “normal” again? In this workshop, Vicki helps you focus on the essentials when you're on the frontlines, especially in a crisis situation. Why do parents choose to homeschool? What is home education really about? Am I qualified to teach my own? What should I teach? What if I fail to teach something really important? The answer to these and many more “frequently asked questions” are drawn from Joyce's many years of homeschooling seven sons. Mr. Karman is the founder of the OCEANetwork. He has lived through many changes. None of these have more effect on your rights to homeschooling than those we are seeing today. In the world every man's way is right in his own eyes. (Prov 21) The climate of Christian home education has changed. The warming that we see is the heat of hostility towards God’s plan. How long will the truth be permitted to be taught in your home or your homeschool? Is the truth worth fighting for? God has plenty to say about the common challenges we face every day with our children. Walk away from this workshop with practical, biblical ways to deal with disobedience, quarreling, complaining, sinful speech, and more — in our children and in ourselves. This is a new era for the Maker. A maker is anyone who loves to build and figure out how things work. How can the parent with the kinesthetic learner keep a stash of supplies and activities readily available for that creative mind? Does teaching reading and writing seem like a daunting task? It doesn’t have to be. Designed for parents of preschoolers and kindergarteners, this workshop will feature developmentally-appropriate activities and experiences that will encourage early forms of reading and writing to flourish. One of the most challenging aspects of homeschooling a houseful is figuring out how to teach them all while finding time to manage the rest of your day! Moms are always wondering if they are “doing enough” and finding the time to teach individual subjects, well, individually… can be overwhelming. In this workshop, Heidi will share seven secrets of multi-level teaching that will empower, encourage and enlighten you! If you’ve got a houseful, then you’ve got your hands full! Let’s laugh together, and rediscover the JOY of homeschooling with a full heart AND a full house! This highly practical workshop will compare and contrast the many different teaching methods and styles commonly employed by homeschooling parents. Linda seeks to share advantages and disadvantages within each method, without preference. Bring your questions. When do you get started and what do you do first? We’ve had precocious readers and late bloomers, but every one of them has benefited from being homeschooled from the beginning. Learn to relax and introduce your little ones to the joy of learning in a gentle and realistic way that will prepare them to succeed academically. Marilyn Boyer has taught all fourteen of her children at home, so she has plenty of experience with any age group you can name. But her very favorite age to teach is those eager, curious, exciting, challenging munchkins we call preschoolers. This, Marilyn says is the time when we lay the foundation for greatness by pouring love and acceptance all over them—instead of treating them like a nuisance. Preschoolers aren’t just little interruptions to be kept “occupied” while older siblings study. This season in a child’s life is the time to tap into his huge potential by maximizing his natural love for learning and helping him to see that God is preparing him for a lifetime of important service. Come and learn from Marilyn how to make your little ones a valuable part of the team!